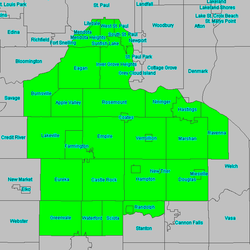 Dakota is one of the least developed of the five counties, and the largest. Their trail system is small but slowly growing. 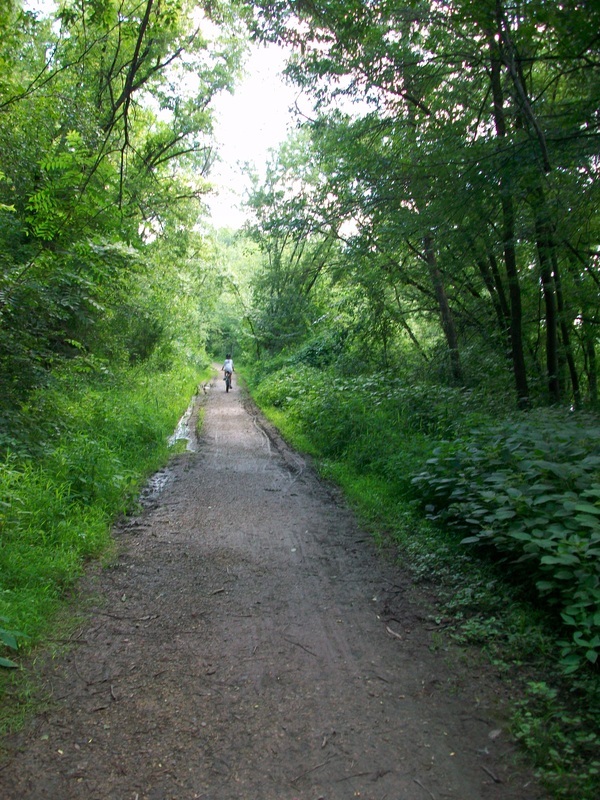 The most popular trail is the Big Rivers Trail, a rail trail which follows the edge of the Minnesota River's wide valley from Lilydale to Mendota Heights, with excellent views of the Mississippi-Minnesota river confluence in Fort Snelling State Park. 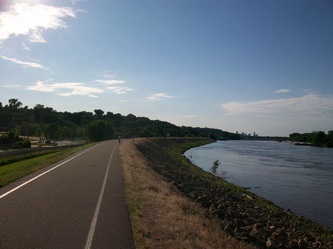 There's also the Mississippi River Trail, which, though still in progress, will eventually connect South Saint Paul and Hastings. 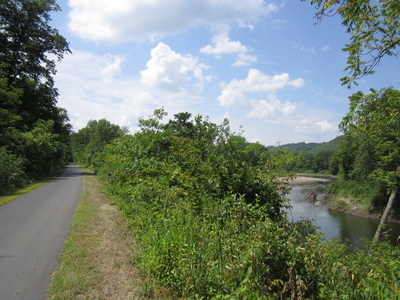 The River-to-River Greenway, also still in progress, connects the two. This overlook is probably my favorite spot on the Big Rivers Trail. Built on a former railroad grade, this is one of the oldest trails in the metro area, and it still works every time. 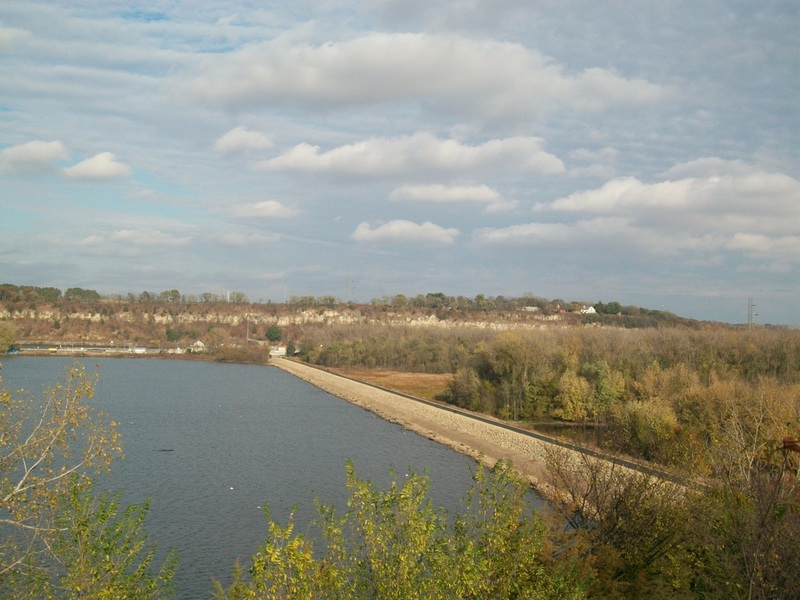 From Lilydale, it gradually ascends to the top of the river bluff along the side of a steep precipice, providing great views of the confluence of the Mississippi and Minnesota Rivers, with interpretive signs. At the top of the ridge is the small, historic town of Mendota. 0.7 miles south, turn right in order not to divert off to a side trail that takes you half a mile into suburban development. 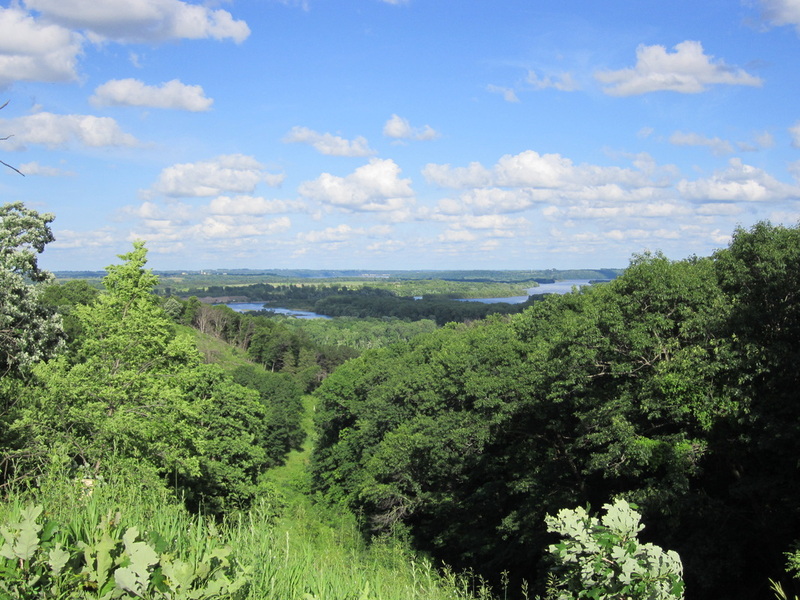 The main trail takes you to an overlook with a view of the Minnesota River Valley and environs beyond. 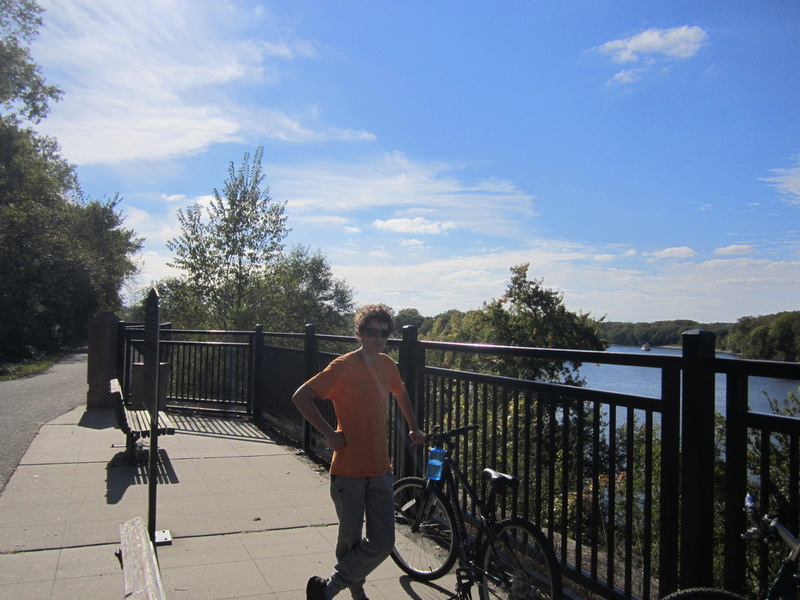 ​ Its connections to the Lilydale Trail, the River-to-River Greenway, the Sam Morgan Trail (via the 35E bridge) and the Long Meadow Lake Trail (via the exasperatingly long 494 bridge from the southern terminus) create all sorts of options for longer rides and loops (like this one). Go to http://www.co.dakota.mn.us/parks/Documents/BigRiversSummerTrailMap.pdf to download a PDF map of the Big Rivers Regional Trail. The Mendota Trail's wooded beauty and rustic solitude make this bicyclist keep coming back for more. It begins at the Sibley House in Mendota, follows a floodplain between the Minnesota River and Gun Club Lake, and ends at the Cedar Avenue Bridge in Eagan, connecting to the Long Meadow Lake Trail. Almost all of the trail is shaded by a peaceful and dense deciduous forest that provides natural air-conditioning on a hot day, and gives a feeling that you are far from any city (the only hint is the occasional plane noise). 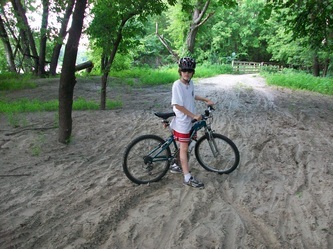 The trail's packed dirt surface fluctuates with the weather and the seasons, sometimes turning to mud or sand after heavy rain. It hugs the scenic river so closely that in some spots you are in danger of falling in, and it is very frequently washed out during spring flooding. 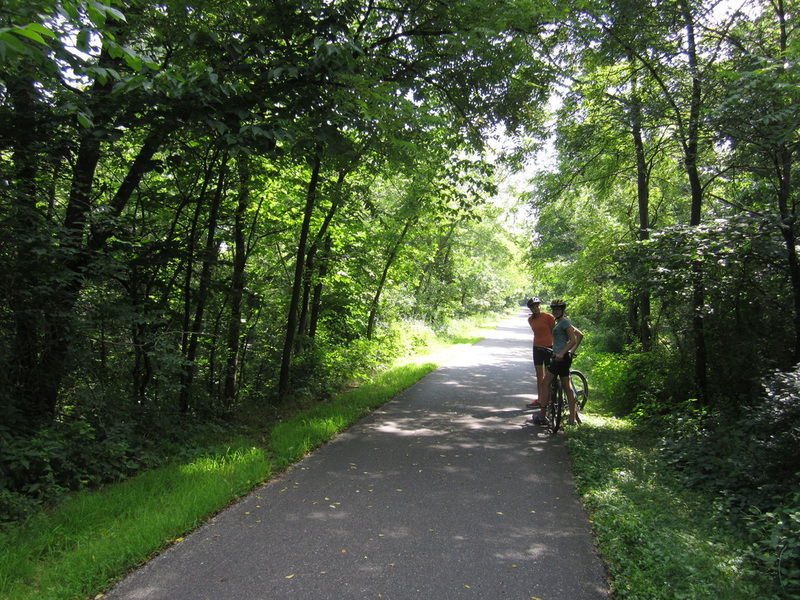 Go to http://goo.gl/maps/QN30K for a map of the South Bloomington Trail Network (courtesy MORC). The Mississippi River Trail's North Segment has its ups and downs, both literally and figuratively. It begins in South Saint Paul, where it follows a levee south along the river. The sky is speckled with river birds from Pig's Eye Island's rookeries, barges chug by to the left, and an expanse of industrial developments sits to the right. Industrial river scenery might not be your thing, but this section makes a case for it. 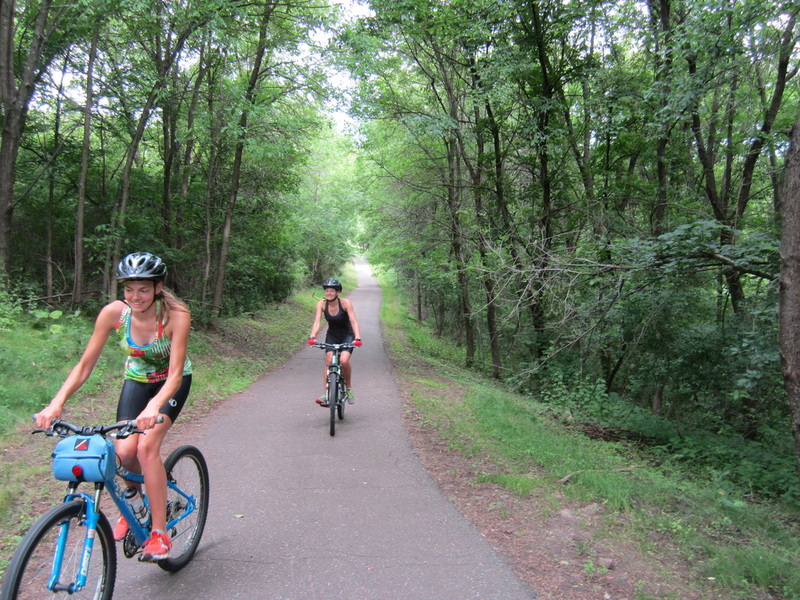 Once the trail enters Inver Grove Heights, though, it leaves the river and switches the dial to nondescript commuter trail as it parallels Concord Boulevard for three miles. There's no scenery to speak of and it could use repaving, so I'd recommend you bypass part of this section on Inver Grove Trail (a side street). After passing through the quieter Pine Bend neighborhood and spending a short time next to Highway 52, you'll reach the Pine Bend Bluffs State Natural Area, the scenic highlight of this segment. As the trail winds through quiet meadows, where from my experience you are more likely to see wildlife than other people, watch for when the trees on the left part to reveal a couple of spectacular views of the maze of channels and islands far below. The segment currently ends abruptly in the middle of a field just past 117th Street. The two segments should be connected via Rosemount within the next few years (more information here). Due to an oil refinery in the way, you can't get between the segments without riding on highways -- for this reason, I have yet to bike the newest 4.3 miles of the trail from Spring Lake West to Schaar's Bluff. But given the panoramic views of Spring Lake from the Schaar's Bluff trailhead, I'm sure it's lovely. Downstream from there, the trail parallels quiet country roads past fertile farmland. There is one confusing and important turn: recross Nininger Road at Madison Street, then take a sharp left. After this, you'll find some more spectacular views from bluffs, before diving downhill to follow a levee to Lock and Dam no. 2. 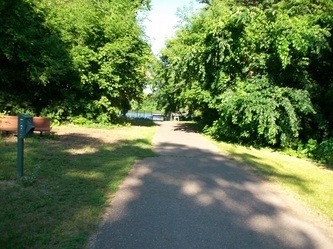 The rest of the trail is along the quaint Hastings riverfront. Go to https://www.co.dakota.mn.us/parks/Documents/MississippiRiverTrailMap.pdf​ to download a PDF map of the Mississippi River Regional Trail. The River-to-River Greenway theoretically connects the Mississippi River Trail and the Big Rivers Trail, and thus two sections of the Mississippi River. However, the trail is a work in progress such that it's unrealistic to call it an actual connection: Much of the middle section is a patchwork of municipal and park trails, which are not in good condition, and not designed for bicyclists. 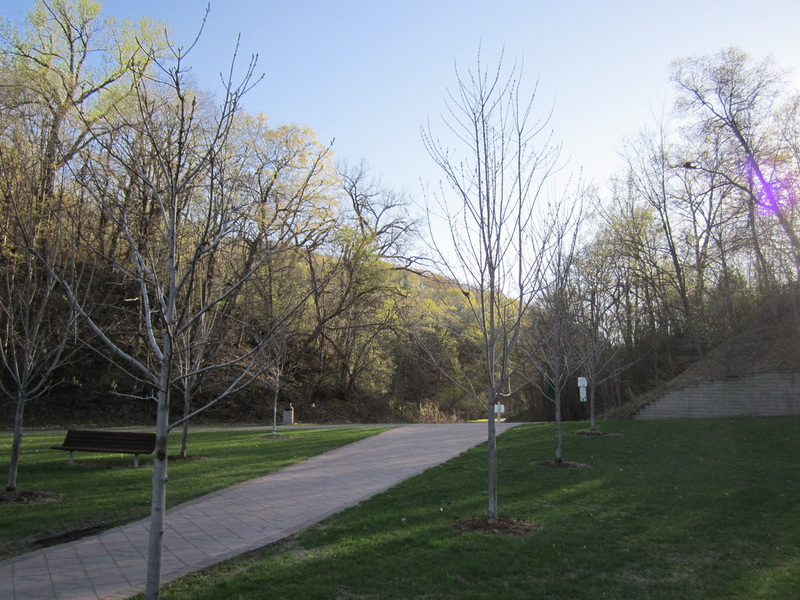 You will find nice spots at either end: Kaposia Park (near the east end) features beautiful Simon's Ravine and one of the Twin Cities' best downhills, and Valley Park (near the west end) is another hilly, wooded area. Begin at the Simon's Ravine Trailhead near Concord Street & Butler Avenue in South Saint Paul. First, take the River-to River Greenway uphill into the woods to Thompson Park. Turn right, following the sign for Thompson Lake, and you will find this little lake perched on the edge of the river valley. Loop around it (the western side is gravel), then coast back down into the valley. You'll find yourself back where you started pretty quickly. This time, merge left, over the bridge. You'll be heading south on the Mississippi River Trail, which follows a levee in this section. Interpretive signs discuss the river's geology and history (South Saint Paul used to be a Dakota village called Kaposia). The landscape includes birds, barges and industry (including stockyards that can sometimes be very smelly)... quite a contrast to the trail you just left. After a few miles, stop at the overlook where the trail leaves the levee. This wooded view is a prime turnaround point. This route takes you up and down the Mississippi River, from the slice of wilderness around its confluence with the Minnesota River, to floodplains, to sweeping views from atop its bluffs. I will start the description at the parking lot of Historic Fort Snelling (but as with most loops, there are many places you can start). Park by the visitor center, then ride downhill toward the fort itself. Just before you get there, turn right on another trail and in a moment you'll emerge on the path next to Highway 55 as it crosses the Mendota Bridge. The traffic on the highway makes for a crossing that's polluted and not very enjoyable, but it's the only way to get across the wide Minnesota River Valley (it was the longest concrete arch bridge in the world when it opened in 1926). Once you're off the bridge, you're in Mendota, a small town dating back as far as St. Paul. Get on the Big Rivers Trail and coast down a ridge while looking at the confluence itself, around Pike Island. Head northeast (downstream) onto the Lilydale - Harriet Island Trail, experiencing the river valley ecosystem in Lilydale Regional Park (the trail is so low it sometimes floods). Choose between the route along Pickerel Lake and the route along the Mississippi River. Some small sections of the trail still follow Water Street. Come out near Harriet Island (no longer an island) with views of the Saint Paul skyline up close. Turn right on the Cherokee Park Trail, next to Plato Boulevard, and climb next to Ohio Street to reach an open view over the hills of Saint Paul, including the Cathedral and Capitol. Once you're done admiring the view, coast down Smith Avenue on the aptly named High Bridge. From the other side of the bridge, there are a few possible routes down to the riverbank. If you want to take residential streets, which I find more pleasant, I recommend you take the second right onto McBoal St, then the second left on Wilkin St, the first right on Forbes Ave, and the first right again on Elm St, which curves left and becomes Ryan Ave. Cross Irvine Park, which is lined with old mansions, and continue on Ryan Ave, merging right onto Eagle Pkwy when the street ends. Coast down the hill and cross Shepherd Road to reach Upper Landing Park, where you'll find fountains, trees and the river, where you will see many a boat and barge. Now, head back southwest (upstream) on the other side of the river. Follow the Sam Morgan Trail, and a viewpoint offers more great views as you pass under the High Bridge. The trail soon turns left and follows busy Shepard Road. 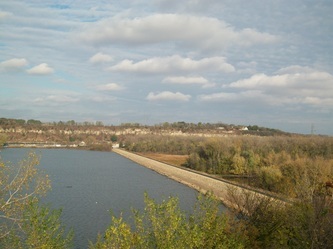 Upon passing under 35E, you have the choice of either traveling atop the bluff on the Sam Morgan Trail and being rewarded with the occasional view; or diving down onto the beautiful floodplain of Crosby Farm Park, which is filled with cottonwood trees and features a spot where one can stand right on a sandy portion of the riverbank riverbank. (The latter route is about half a mile longer.) 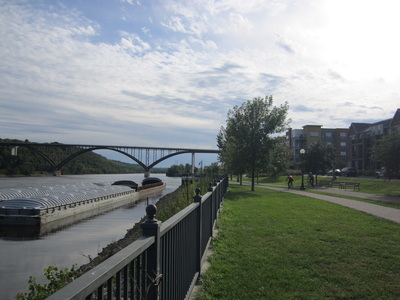 After admiring the confluence of Mississippi and Minnesota once again via the Two Rivers Overlook, head back to the historic fort via the Highway 5 bridge (the stairways on either end are equipped with rails along which you can walk your bicycles). Trails that are outside the metro area, but worth mentioning. If you stop and listen along the Cannon Valley Trail, you will hear birds, gurgling streams, and behind that nothing. Running from Cannon Falls to Red Wing, this lovely converted railroad grade follows the final 20 miles of the Cannon River. The western half features views of the river and the strikingly sheer bluffs that surround it. The eastern half, which is flatter, heads across a floodplain, showcasing woods, wetlands and water. It's definitely worth the hour-long drive from the Twin Cities. Go to http://www.cannonvalleytrail.com/images/CVT_MAP_2006_2.pdf to download a PDF map of the Cannon Valley Trail. 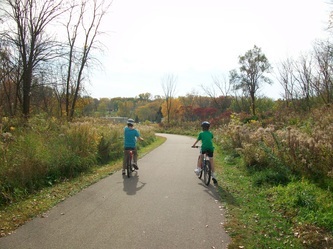 A pass is required to bike on the Cannon Valley Trail for those ages 18 and older; more information here: http://www.cannonvalleytrail.com/wheelpass.htm.